Two very traditional holiday foods are at the heart of these Rescued Recipes. Both are native crops to America, but neither one gets any “airplay” until the holiday season. 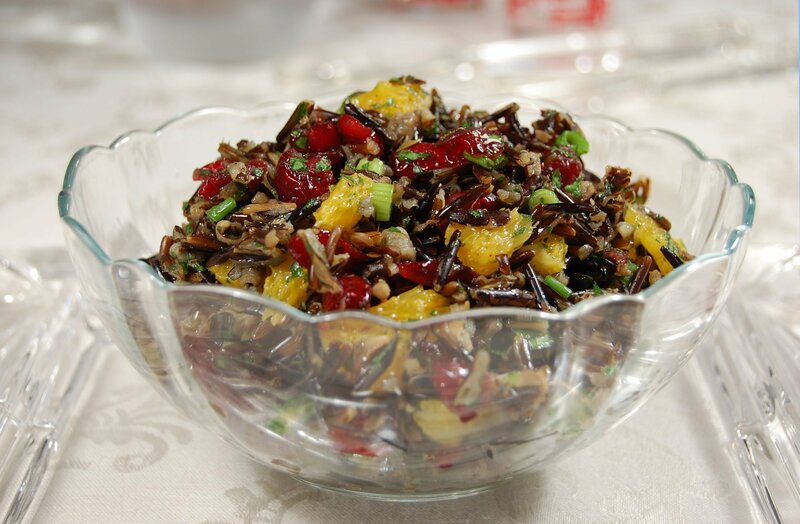 That’s when wild rice and cranberries take center stage – or at least “side” stage – on our feasting table. But two Rescued Recipes could turn these once-a-year specialties into everyday favorites! Cheryl, we went wild over this salad! We loved the flavor, texture, and the color! It’s festive, fun, and goes really well with chicken, pork, fish, or just great as a main meal! Cook the rice in a large pot of salted boiling water until just tender (about 40 minutes). Drain it in a colander. Meanwhile, cut away the peel and pith from the orange. Then, while holding the oranges over a bowl to catch the juice, remove the segments from the white membrane and cut them into small pieces and place them in the bowl. Combine the vinegars, salt, and pepper in a bowl. Slowly whisk in the olive oil. In a large serving bowl, combine the rice, scallions, dried cranberries, parsley, and the orange pieces with their juice. Drizzle the vinaigrette over the top, gently toss it, and serve. For the best flavor, prepare the day before.